Her government lawyer lodged a last-ditch appeal with the Supreme Court on Tuesday, but it was unclear whether the court would even respond in time. Barring a dramatic twist in events, the Senate was to start debating impeachment at approximately 9:00am (1200 GMT), with voting expected either late at night or in the early hours of Thursday. A majority of more than half of the senators in the 81-member chamber would trigger the opening of a trial and Rousseff’s automatic suspension for up to six months. In the final judgement, removing her from office would require a two-thirds majority. She is accused of breaking budgetary laws by taking loans to boost public spending and mask the sinking state of the economy during her tight 2014 re-election campaign. Rousseff says the accounting maneuvers were standard practice for many governments in the past and describes the impeachment as a coup mounted by her vice president, Michel Temer, who will take over if she is suspended. A one-time Marxist guerrilla tortured under Brazil’s military dictatorship in the 1970s, Rousseff therefore faces possibly her final day in power Wednesday. Temer, whose centre-right PMDB party broke off its uneasy partnership Rousseff’s leftist Workers’ Party, has already prepared a new government, saying his priority will be to take action on the moribund economy, now in its worst recession for decades. 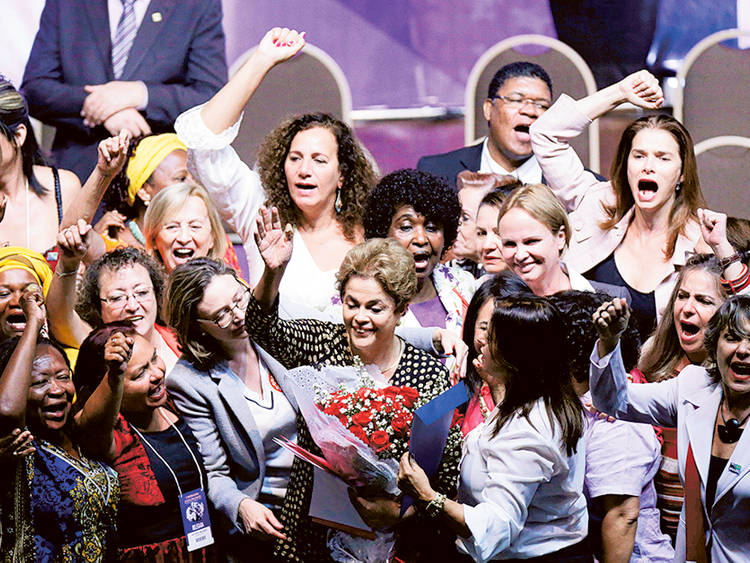 “I am going to fight with all my strength, using all means available,” she told a women’s forum in Brasilia on Tuesday. In an effort to cripple Temer’s ambitions, Rousseff allies went to the top electoral court asking that the probable acting president be barred from appointing his own ministers, Folha newspaper reported late Tuesday. However, analysts say Rousseff’s fightback probably comes too late and that she had already burnt many of her political bridges before the crisis erupted with an awkward style and inability to negotiate. The country’s first female president has also become deeply unpopular with most Brazilians, who blame her for presiding over the recession and a massive corruption scandal centred on the state oil company Petrobras. Workers’ Party faithful on Tuesday burnt tires and blocked roads in Brasilia and in Sao Paulo in a potential taste of more street trouble to come. Police responded to heightened tension by building a huge metal barricade outside Congress in Brasilia to separate rival groups of protesters during the Senate vote. A separation corridor 80 meters (yards) wide and more than a kilometre (half a mile) long will also be enforced. A square where major government institutions are located will be declared a “national security zone” made off-limits to the public, the Brasilia security authorities announced. A veteran centre-right politician, Temer is also highly unpopular and would inherit the crumbling economy as well as a resentful left. Although he has made no public pronouncements in the immediate run-up to the Senate vote, he has been negotiating with allies about ministerial posts and measures Congress would pass to try to breathe some life into the economy. Stocks in Sao Paulo rose more than four per cent as the markets bet that Rousseff was on her way out, to be replaced by a vice president seen as more business friendly. The Senate impeachment trial could last months, running through the Olympics, which open in Rio de Janeiro on August 5 — the first Games to be held in South America. Fears over the Zika virus, high crime in Rio, pollution in the sailing and some swimming venues, along with a budget crunch, are already hurting preparations for the Games, together with worries political instability could overshadow the event.